I tripple love organization solutions! Love! Love! Love! Bins, baskets, jars, crates, totes, bowls, boxes, canisters... I love them all! Honestly, I would collect storage solution options of all shapes and sizes if I had an appropriate storage solution option to keep them organized! Woo!! *I dare say that Robert would not be pleased with such an idea. Alas, a girl can dream! The beauty of organization is that everything, and I mean everything, can have a spot of its own. And isn't that what we all want? A special place in the world! What makes our things any different? *Too dramatic perhaps? Panpsychism anyone? And I digress... a topic for another day perhaps. We organize things to help make our lives easier. Do we not? It is much easier to run out the door at the last minute for a lunch date if your keys, money, sun/glasses, and shoes are all reliably within arms length of one another. Or, taking the kids to the beach is much more enjoyable if your gear is all together in one bin or basket. So, if every area of our house had its own tidy purpose life as a whole would be that much less stressful. I am making it a goal of mine to do just that this year! *But be mindful that everyone is different. What works for me may not work for you. I may put my pool/beach gear in a basket in the laundry room which isn't a practical place for your home. Take the ideas of others and alter them to your lifestyle. And be willing to revisit things. If you organize your entry space one weekend and get it just so but find it quickly returns to its original state, don't give up. Try it again and make the changes needed so that it can upkeep itself. 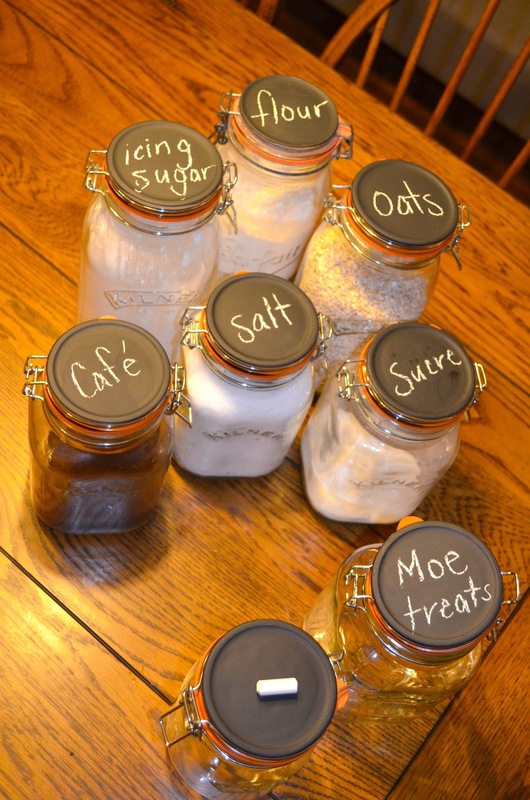 On top of everything having its own place, which is certainly a mighty fine place to start, labelling can add yet another level of practical help for daily living. *And it can be super cute to boot! Begin by covering your work surface with the newspaper or drop cloth to prevent any mess. Wipe down your jar or canister with a damp cloth and let it dry completely before applying the paint. You can find chalk board paint at your local hardware store. I went with the above, Rust-Oleum, brand and was more than satisfied. Follow the directions on the can for the best application results. Mine required three coats, each drying completely before the next, and letting the paint set for two days before writing on them. *Patience certainly is a virtue in this case. I decided to apply the chalkboard paint to the top of the jars but you could tape off a section on the sides if you preferred. For this project I opted for the top because I plan to place them on a lower shelf in the pantry and imagine they'll be easier to locate that way. Not to mention, I wont have to move them all to find the one I am looking for. Im excited to add these to my pantry space when it is complete! And expect they will be helpful tools in keeping my kitchen organized in the future. But honestly who knows where you may find them around the house next! Thanks Brittany! I am beyond please to read that this post was helpful for you. I used to subscribe to Real Simple and often found they had great storage and organization solutions! Oh dear land, these are adorable. LOVE it! I've been wanting to do something like this for a while now & just haven't gotten around to it yet. Isn't chalkboard paint the absolute best?! And you can use it on items you already have around the house! Thanks for taking the time to stop by and read Leanne!